A large selection of products for the food and beverage industry is available as stock items and will be supplied to you in the quantities you require. Consolidated Bottle began operations back in 1910 in the food market selling glass bottles to the bar and liquor industry. We have been continuing to service and develop this industry since that time. Our stocking program offers an expansive scope of products custom suited for this industry. Please see our catalogue. 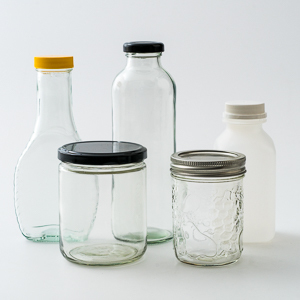 We offer a wide variety of glass, HDPE and PET juice, wine and spirit containers. Our design teams can offer innovative ideas and extensive experience in development of new product lines. We can also silkscreen, label, or shrink sleeve your package all under the same roof.